Upon the recommendation of one of my blog readers, I recently read, actually listened to on my ipod, Jared Diamond's book Collapse: How Societies Choose to Fail or Succeed. This book provides a jolting history of many societies through the history of this planet and how their environmental values lead to their success or failure. The most intriguing part of Collapse for me were the numerous examples of societies who over exploited their own natural resources, became dependent upon others, and then collapsed as the other society grew to consume their own output. Some, who had no others to depend upon, simply collapsed more quickly. In a number of examples, religious values appeared to have clouded the judgement, leading to an accelerated collapse. Diamond, in his factual writing style, stopped short of making any direct conclusions about our current society, choosing instead to leave that to the reader. From my own perspective, the parallels to our current society were striking. Diamond presented a question throughout the book, of what was the person thinking on Easter Island when they cut down the last tree. Of course, it wasn't about the last tree. By the time they were down to the last tree, it was way too late. 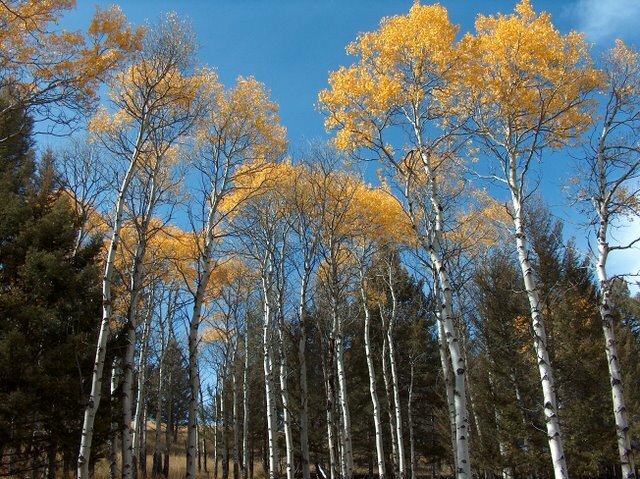 The collapse occurred when the critical mass of trees hit a tipping point and proceeded toward decline. At this point in time, no one realized the tipping point. Much like our own environmental exploitation today, people feel all to comfortable continuing to pollute our environment, continuing to kill off species, continuing to segment eco-systems, ... None of us know where the collapse tipping point is, but there is reasonable evidence that it is not far off. While you can draw your own conclusions, the book is a excellent primer on the failure of past societies and their failure to sustain their environment. Hopefully, we as a society can learn from their mistakes and prevent making more of our own. I was previously familiar with Diamond as I had listened to his book Guns, Germs, and Steel: The Fates of Human Societies. I would highly recommend this book as well. In my last post I was accused of villanizing the car. I thought I would keep up the villanizing, but this time shifting to smokers. I will stay off the topic of smoking in general, as I do have my own habits that others might not approve of. One of the things that really annoys me is to see people throw their cigarette butts on the ground. I view this as the equivalent of me taking my coffee cup, and throwing it on the ground when finished (although I try to always use a reusable cup). I believe that most of the smokers would be appalled at me, but they have no problem littering where ever they are. How is this different? For the past few years I have been riding the bus to work, when not biking. Most of the bus drivers smoke and most of them through their butts in the street before starting their route. I have complained to the city and asked for ash trays at the bus stops to no avail. The people who don't use the street end up using the potted plants, which makes a very nice message as well. A couple of days ago, I am walking up to get on the bus and another passenger throws his cigarette on the sidewalk and steps on it. I say, "are you going to pick that up?" He did pick it up, but then responded, "quit looking at me and get on the f$%king bus." All phrased of course as if I was the unreasonable one. He probably threw it back down after I turned away. Last week in Yellowstone, three tourists stop at an overlook in the Hayden Valley. Beautiful country spread out in front of us. They smoked their cigarettes and then threw the butts on the ground. I asked them to pick them up as well, which they did. The response again was an incredulous look at me as if I was being completely unreasonable. I have committed to myself to continue to point this out to individuals. I hope I can stay safe doing it. The response from the other bus passenger was much more hostile than I had expected. As part of my membership in the Public Participation Committee for the Community Planning Association of Southwest Idaho, I came upon an article written my Margy Waller of the Brookings Institute on Auto-Mobility: Subsidizing America's Commute? I found the article fascinating and educational, opening my eyes to the extent that our society is dependent upon automobiles, not just as a preference. The article begins with something we are probably all aware of. When hurricane Katrina hit, those with cars evacuated, those without could not and did not. The part I didn't realize is that now that those people are in trailer-park camps, their prospects are dim as they have no transportation to where the jobs are. They are physically isolated from any economic prospects. This situation isn't just applied to major catastrophes, but the general prospects and access to employment, education, health care, etc. "There is reason to believe that not having a car isn't just a consequence of poverty - it's a barrier to escaping it." Other studies mentioned in the article highlight this fact. The article goes on to present a solution to the problem which would enable easier and subsidized access to cars for the poor. The economic development resulting would have a positive impact on the economy. There are aspects to the proposal I like, but some aspects which I don't - more cars, more congestion, higher demand for gasoline, higher green house gases released into the atmosphere, and lower national security to name a few. It is essentially trying to treat a symptom of the problem and basically shifts the issues elsewhere. The issue is where we are developing our country. The article points out that - Two thirds of people in metropolitan areas live in the suburbs. Two-thirds of new jobs are there as well, causing a whopping 88% of people to drive to their work. This trend is playing out in Idaho right now. Since both the jobs and the homes are being built outside the city, and not in the same place, traffic congestion is ever increasing. This sprawl continues to decrease the chances that public transportation can be used to address the issue. Building more and widening roads also has its limitations. The hot development approach right now are planned communities. These planned communities have a multiplicative effect as people must commute to these communities to work in the service industries that are required to be located there (as no one that can afford to live there would be willing to work there) and the people that live there all commute into the city. Just three months ago, Ada and Canyon counties (and the other entities included within), after three years of development, approved the Compass Community Choices 25 year plan for the valley. This plan called for greater density of employment and housing along major corridors which could more effectively be served by public transportation. This community choices plan was contrasted with the "trend" plan. What has happened since then, is the further sprawl through highly distributed planned communities. If the currently planned "planned communities" are approved, our traffic and congestion will be far worse than the trend scenario, making the community choices scenario unachievable. The trend scenario had a number of implications - a doubling of the current commute times, much more expensive road system, few transit choices at a higher cost, 80,000 more acres consumed, 1.1 million miles per day of additional commute traffic, etc. What about the new trend? Its even worse! After a fairly stressful few weeks at work, with some equally stressful situations in our bathroom remodel, we finally made it out of town on our week long vacation to Yellowstone National Park. Its been over a year since we have visited, so we were both quite excited to get on the road. Karyn has signed up for a three day art workshop with wildlife artist and conservationist, Robert Bateman. I plan to spend a few days alone fishing, wildlife watching, guitar playing, and basically hanging out. After Karyn's workshop is over, I'll pick her up so that we can spend the remaining 4 days together enjoying this country. We expected to see the first wildlife in our backyard, but the neighborhood raccoons chose not to greet us this morning. We loaded the ipod with a book on tape and headed east toward the park. The drive was fairly uneventful, with the highlight being the drive through Camas Prairie. It seemed like every 5th power pole had a large hawk sitting on it. This being the peak migration time for raptors, many were probably just passing through. We saw many Red-tailed Hawks, a Golden Eagle, a Kestrel eating a mouse, maybe a Swainson's Hawk, and many that in the brief pass we could not identify. We entered the park at about 2pm in the afternoon. A goal of our for this trip is to see River Otters as neither one of us has ever seen one. At each available turnout we stopped to search the river for signs, but we could to find them. We slowly made our way from pull out to pull out until we reached our campsite at Madison junction. The River Otters would have to wait another day. A short walk from our campsite we reached a large open meadow. It was amazingly beautiful. Its what makes this place so special. There are other areas which are equally as beautiful in Idaho, but most are filled with houses, fences, and/or cows. 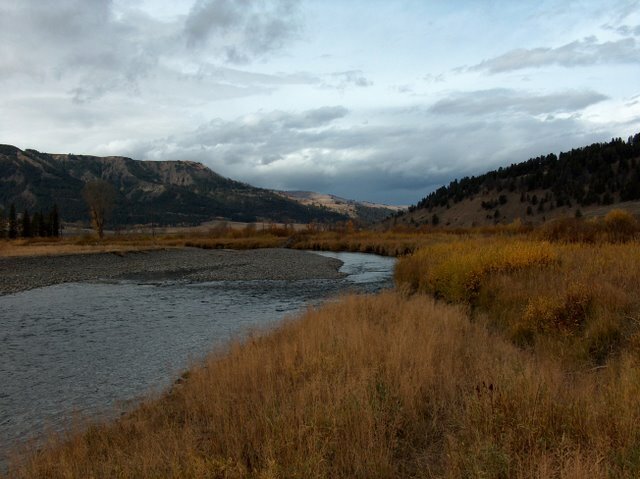 This meadow was only filled with the grass, the river, the breeze, and a brazen bull elk with his 6 member herd. The bull ensured everyone in the valley was aware of his status as he bugled every ten to fifteen minutes. We watched for a while, returned to camp for dinner, then returned to the meadow to watch the sunset. The bull was still there, although much more agitated as he was rounding up his harem. We continued to hear his bugle as we returned to camp for the evening. It sure is great to be here! Other species identified: Bison, Black-billed Magpie, American Crow, American Coot, Canada Goose, Mallard, Raven, Clark's Nutcracker. Somewhat tired from the past few weeks, we decided to sleep in, at least until 7am. This is somewhat late as once we begin wolf watching, we will be out before sunrise. We awoke to the sound of the bull elk bugling in the meadow. In fact, each time we awoke in the night, the bull elk was also bugling. 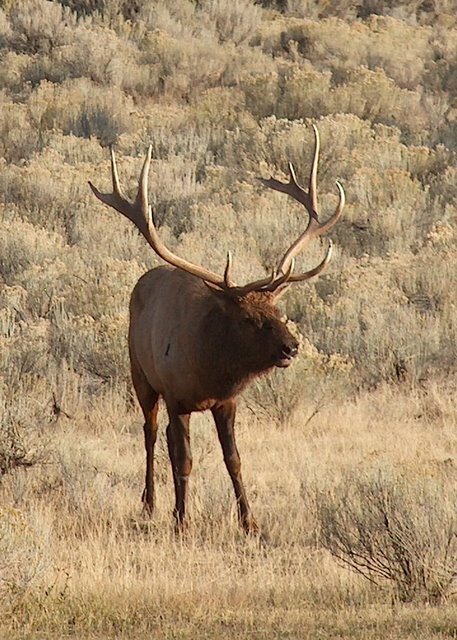 I can now understand why bull elk are such easy prey after the fall rut, consuming so much energy trying to mate. A short distance down the road, we stopped at Gibbon Meadow. We have watched wolves here in the past. Today we watched 6 bison lazily foraging. Some movement in the grass turned out to be two Ravens. Good birds to watch as they will sometimes follow wolves or bears. Karyn spied a Canid on the far side of the meadow. Turned out to be a Coyote. We watched as it wandered the meadow, pausing ready to attack, hop, hop, and pounce. On at least a few tries he was successful. 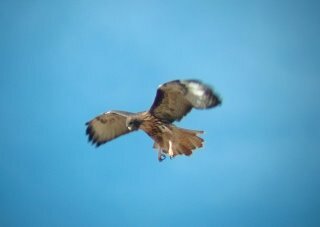 Moments later a female Marsh Hawk (Northern Harrier), flew through our line of sight. We watched as she glided low over the grass, occasionally rolling in flight and pouncing on the ground. We stopped at a number of pull-outs to look for river otters. We didn't find any, but did find a few Trumpeter Swan's on Nymph lake. Moving on down the road, we arrived at Swan Lake Flats. We have also watched wolves here before, but there were none in sight today. Out on the lake, a number of American Coots intermingled with a load of un-identifiable ducks. This was a great place for lunch. Once in Mammoth, we decided to hike part way to the beaver ponds. We ended up hiking the whole loop. It was a beautiful day, although a bit windy. The Aspens had already turned colors and we were occasionally showered in leaves. Not much wildlife present. Since this is bear country, we weren't too disappointed. After checking Karyn into her room for her class, we headed out to Blacktail Deer Plateau to cook our dinner. We have never watched wolves here, although the Leopold Pack calls it home. They were apparently hiding this evening. The only thing we saw were some Bison, Ravens, and another Marsh Hawk. Karyn suggested that we move to a different part of the Plateau, where we often see wildlife. There we watched ducks and Coots in the pond, while a heard of Bison wandered near the other side. Karyn, with her eye for spotting wildlife, pointed out an Antelope high on the hill and a juvenile Bald Eagle. The light started to fade as we headed back to Mammoth. Some Blacktail Deer crossed the road in front of us on our way. I am staying with Karyn this evening, leaving early in the morning for the drive into the Lamar Valley to go wolf watching. Karyn's class begins in the morning. Other species: Chipmunks, Canada Goose, Black-billed Magpie, Brewer's Blackbird, American Robin, American Kestrel, and Mallards. 5:20am. Ouch. The bed in the hotel rooms at Mammoth could easily be improved upon. Not nearly as comfortable as the van. Karyn got up and joined me for coffee and breakfast in the van before I headed out in the dark toward Slough Creek. The road between Mammoth and Tower Junction is very dangerous in the early morning darkness as animals often jump out in front of you, or large black bison just stand in the road. This morning was fairly clear. I was approaching Slough Creek, which is located just below the Lamar Valley, when I met most of the wolf team driving toward me. Apparently there were no radio signals present in the Lamar Valley. The wolf team tracks the signals emitted by the radio collars on some of the wolves. The lack of signals in the Lamar does not guarantee that there are no wolves, but it is most likely the case. There is at least one radio colored wolf in each pack in this area except for one, the "unknown pack". My trip into the Lamar Valley would have to wait. I positioned myself at a location referred to as "Little America", named after a depression in the meadow roughly shaped like the United States. Some members of the wolf team were seeing some wolves in our area from a few miles away. I search from my angle, but we could not find them. The wolf team was also picking up signals from high on Specimen Ridge. No sign from my angle either. I drove on to a place called Elk Creek where they were seeing two wolves just before I got there. They moved out of sight as I was setting up my scope. We received word as well that they were seeing wolves at the Hellroaring overlook. Of course, once I got there, they were gone. This is how it would be this morning. Lots of wolves in the area, but I got "skunked". No worries, it is early in the week. I drove back to Slough Creek campground to get a spot. Scored one of the nicest spots there. The guy from the camp next door started talking about fishing with me. He made a statement that anybody can catch fish in Soda Butte creek. I would have to prove him wrong, which is exactly what I did. It was a beautiful cloudy day when I headed out to try my luck. I fished for about an hour before a strong wind started up. Nothing. It was amazing just being there. I came to realize first hand some of the transformations taking place in Yellowstone. Before wolves were reintroduced in 1995, the elk population would hang out near the river eating the willows. With no real predators, they had little to worry about. 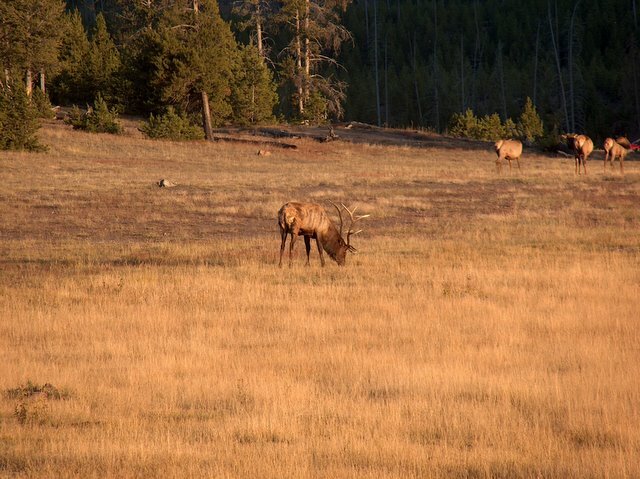 The reintroduction of wolves has caused the elk to be much more alert and spend more time on the move. They also avoid areas that make them more vulnerable such as low visibility areas near the water. This has caused the willows and cottonwoods to begin to grow back, beaver are returning, and in the long run, it should restore trout habitat. I didn't see any beavers, but did walk through a large area of new willow growth. The "experience" came as I realized that I was in bear country, walking through shoulder high willows, with limited visibility. It definitely increases your senses. 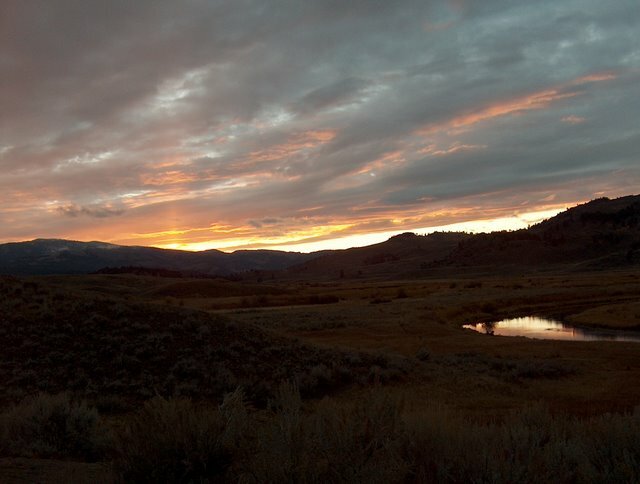 This is one of the things I love about Yellowstone, you can't take it for granted. After fishing I retreated to a place call "Dorothy's Knoll". It is a turnout at the high point in the Lamar with the valley laid out in front of you. Here I looked for wildlife, seeing elk, antelope, bison, and ravens. I practiced guitar as the rain fell outside. Another wolf watcher named Larry introduced himself. We would talk on a number of occasions through the week. Moved to overlook Slough Creek to cook dinner. It is raining harder outside. It was back to the Hellroaring overlook for the evening wolf watching. Unfortunately there wasn't much watching. The group that I had missed in the morning was still apparently bedded down in the area, as the wolf biologists received strong radio signals. The hard rain and fog made it impossible to see anything. Thus I returned to camp on a wolfless day. Other species identified: Blacktail Deer, Black-billed Magpie, American Coot, Mallard, and American Wigeon. Wow! What a difference a day makes! The wildlife watching began very early this morning. About 3am, I awoke to the sound of some rustling in the van. I flipped on the light and saw a Deer Mouse scurry across the counter top. I got up and jumped around hoping to scare it away. It must have worked as I didn't hear it again. Where is my mouse killing wife when I need her (for explanation see our Anniversary Week Story). I pulled out of camp while it was still dark. The first stop was "Dorothy's Knoll" in the Lamar Valley. I arrived in time to briefly watch seven members of the Slough Creek wolf pack cross over the ridge. From that point there are three likely routes they could take. Two of them would have them re-appear in lower Slough Creek. The other would leave them out of sight. Most of the wolf watchers and I repositioned ourselves at "Dave's Hill" overlooking two of the possible routes. We waited, but there were no signs. The biologist confirmed that there were no radio signals from the Slough Creek wolves. Over the radio we heard that another group found a wolf killed elk near the "Wrecker" pullout. Everyone at Dave's hill cleared out in a hurry. We arrived at "Wrecker" to find an excellent view of the wolf kill, probably about a mile away. 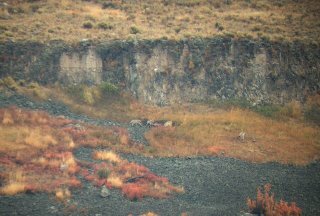 The 6 point bull elk was lying at the base of a small cliff with 13 of the Agate Creek Wolf pack proceeding to eat. The rest of the elk herd was located above the cliff. It is believed that the wolves chased the bull elk over the cliff. We had an excellent view of the action and I was able to take a number of photographs. I met up with two of the wolf watchers that we had met last year when we were here. This brings the total to 8 people here now, that we have met on previous visits (Mark, Carol, Jim, Paul, Jan, Bill, Anne, & Rick). Some of these people are very committed, spending more than 100 days a year in the park. Some own second homes just outside the park in Cooke City. As we watched the ravens (10-12) and Magpies (10-20) started arriving. Within another hour a mature and a juvenile Bald Eagle arrived. The wolves had their fill then slowly meandered down toward the river and out of sight. Everyone, thinking that the wolves may cross the river and then possibly cross the road, left to go to the potential crossing site. I decided not to get involved in the huge traffic jam, known as a wolf jam, and stayed where I was. A few others stayed as well. We looked at the carcass and noticed that now there were two coyotes eating. Everyone gets a chance. I walked to the van to get some munchies, then looked through the scope at the biggest coyotes I have ever seen (wolves). The wolves apparently went to the river for a drink and then returned, chased off the coyotes, and resumed eating. I watched for another hour until they slowly wandered down the hill and out of sight. I decided to take a break from the wolf watching and hike out to try and photograph some badgers. One particular trail has a lot of badger activity on it. I carried the tripod, scope, and camera a few miles out in the hopes to find a badger, but no luck. I did see coyotes, bison, and a couple of antelope fairly close. There are a few places on the trail where the visibility is fairly limited. This once again gave me that vulnerable feeling that makes me appreciate this place so much. The trail also gave me another view, although a fairly distant one, of the kill site. I could see the coyotes and eagles on the carcass. In the evening, I positioned myself at a place called "Boulder". This was a little bit further away from the kill site than "wrecker", but it was higher and provided a unique perspective. From here you could see the wolves bedded down a couple hundred yards from the carcass. A Golden Eagle had arrived at the site, joining the juvenile Bald Eagle (it could also be a juvenile golden instead of a bald). When the coyotes weren't eating, the eagles would swoop down and tear off chucks of elk. Then out of nowhere, a large grizzly bear showed up on the carcass. This was not looked upon favorably by the wolves. The wolves ran up and surrounded the bear. The bear would scratch at the ground and then charge the closest wolf. The wolves would scatter. It was clear that the grizzly was not going to give up the carcass. The wolves, full from their multiple feasts, had little reason to risk their lives for this carcass other then pure pride. They eventually gave up and bedded down a few hundred yards from the site. The light of the evening started to fade. What a day of wildlife watching! Definitely one of the best! When we are wolfwatching we often share our scope so that others passing through can see wolves and grizzly bears. Since the animals are so far away, binoculars are much more difficult for inexperienced people to see the animals. Most people you meet this way are very appreciative, some you wish you hadn't shared at all. Today, there were only nice people. Since Karyn wasn't with me, I shared with more people than usual. Your eyes can only look through the scope so much. All morning there was a woman from Wisconsin who I regularly let look through the scope. When she left she insisted that I take two Wisconsin beers from her. I am enjoying one while I type this report. This evening a group of national park employees from the various parks around the country stopped by. They were in Yellowstone for a conference. I allowed them to view the wolves and the bear. They were extremely excited about the opportunity and extremely grateful. This is how we first got hooked on wolf watching. A generous couple from California was in the Lamar Valley one morning and let us look through their scope at the wolves. We bought the same model scope that they had. Another interesting day today. I started at "Dorothy's Knoll" looking for the Slough Creek pack as they were somewhere high on Speciman Ridge. After searching for awhile, the biologist indicated the the radio signals were no longer present, meaning the wolves had crossed over the ridge out of sight. I decided to check out yesterday's carcass from "Wrecker Point". There were six coyotes on the carcass with the Golden Eagle sitting on the rim above. Apparently the Grizzly bear moved on just after sunrise. I watched as the coyotes fought with each other over the best pieces of the carcass. After about 30 minutes, I decided to drive up to Antelope Creek to see what was going on there. I hadn't been there yet on this trip. Antelope creek is the center of the Agate Pack territory. They were essentially out of their territory when they killed the elk yesterday. About half way there I hear over the radio - "all units proceed to Antelope Creek as fast as you can." This is very unusual and most often means that something very unique is happening. Since this is the time of year that wolves travel and try to expand their territories, I guessed that it was a border dispute between the Agate Pack and Mollie's Pack (which occasionally travels this far north looking for territory). Upon arriving, I learned that the Slough Creek pack had crossed over Speciman ridge and came down into Agate country. The Agates had just put on a full chase. The Slough Creek pack had retreated. I didn't see the Sloughs, but did see 10 of the Agate pack in hot pursuit. They finally stopped in a group and howled for about 5 minutes. 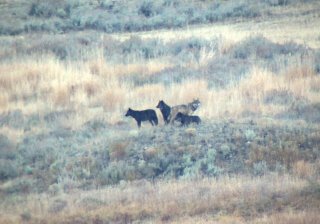 Over the radio we learned that once the Slough Creek pack was back in their territory, they regrouped and howled as well. We watched as the Agate group slowly came back toward the center of their territory. At least two more wolves of the Agate pack were very near to us and started howling. The 10 member group, at this point a few miles away over the Yellowstone river, grouped up and howled back. The puppies in the big group of 10 (at least 4 were pups of the year), kept running toward the sound of the howls. It appeared that the adults were in no hurry to come back. They kept facing the direction that the Slough pack had retreated. The two groups continued to howl back and forth, but the group of 10 stayed in their advanced position. We finally spotted two of the wolves left behind as they were trying to make their way toward the core of the pack. 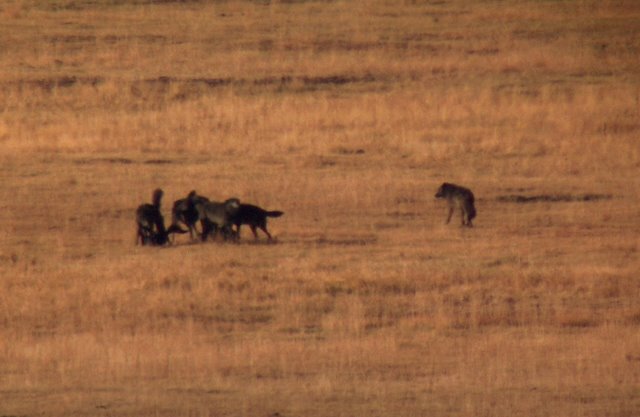 We never did see the 13th pack member, but it could have been traveling with the two (I learned later that the last member did join up with the 2 traveling toward the group of 10). I left Antelope Creek to meet Karyn for lunch in Mammoth. I picked up her gear and then drove to Gardiner to restock the van. The Mammoth hotel was a very interesting place. A large 7 point bull elk was threatening people, cars, anything in sight. I was sitting in the van waiting as the elk came around the corner of the hotel. Just then a person stepped out of the back of the hotel. The bull started toward them. They retreated, so the bull walked over and rammed his horns into a Volkswagen. It shook the whole car. I wanted to move the van, but was afraid to attract the bulls attention. Karyn crawled in the back doors of the van to avoid the elk. As we were leaving, the bull was in a stand off with another bull across the mainstreet of Mammoth. Not sure how many cars would be lost in this showdown. We drove back to Slough Creek, stopping to view yesterday's Carcass site to see 4 coyotes still chewing away. Other species identified: Bison, Coyote, Blacktail Deer, Bighorn Sheep, Raven, Magpie, Ring-necked Duck. Apparently, Karyn's "mouse killer" reputation precedes her as the mouse did not come back into the van tonight. Back to the Lamar for Karyn's first day of wolf watching. We started at a turn-out known as "garbage can". I believe all the place names are intended to be a secret code. In this case there is no garbage can at "garbage can". I have learned a few new place names this year, "garbage can" being one of them. Karyn and I and two other wolf watchers were on the hill above "garbage can", when one of the other guys noticed a black wolf with its head up in the grass. The wolf would raise its head and then put it back down out of sight. We decided to move closer, so we moved to a place known as the "exclosure" (this was the first place Karyn and I saw wolves in the wild. yes, there is an exclosure there.). 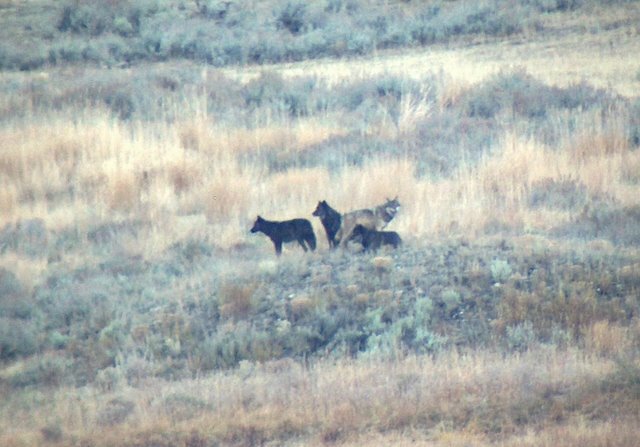 Watching we noticed one head up, then two, then three wolves stood up, then four, five, six, seven black wolves of the Slough Creek Pack. We watched them wander through the meadow. They gathered for a group howl and then a tail-waggin' fur frenzy (see picture). They would slowly wander out of the meadow into the trees. We made our way down to the "itching post". This is our name as the parking area is really called the "hitching-post" as the horse outfitters use it and there really is a hitching post there. The bison also use it to scratch their neck, hence our name. Most of the post is worn down from their necks rubbing against it. We met up with Larry, an individual who I have talked with at least once each day wolf watching. Henry, a local Silvergate resident was there as well. Apparently Larry is camping in Henry's yard. Henry had a George Bush voodoo doll on the front of his car. We talked politics for about an hour. We finally pulled ourselves away and headed toward Antelope Creek where they were currently seeing the Agate wolf pack. By the time we arrived the wolves had moved out of view. We proceeded up Dunraven pass to look for bears, but didn't find any there. We did find some Red-tailed Hawks which had very different markings than in Idaho. We watched as the hawk in the photo dove and captured a mouse. This evening we returned to "garbage can" in the hopes that the Slough Creek wolf pack would come back out of the forest. We heard them howl a number of times, but they did not reappear before dark. We did watch a badger in the meadow and a number of coyotes. Jim, one of our wolf watching friends, was there and appreciated the badger spotting. 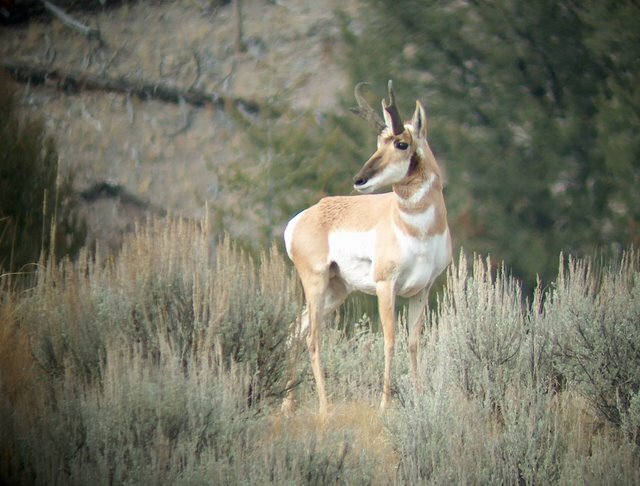 Other species identified: Antelope, Bison, Bighorn Sheep, Elk, Blacktail Deer, Marsh Hawk, Raven, Magpie, American Crow, Golden Eagle, Great Blue Heron. All the action this morning was right near our campground. We started out on "Dave's Hill" at the entrance to our campground. The Slough Creek wolves were expected to be somewhere in the large Slough Creek meadow. Our job was to find them. Stanley, the same gentleman that found the wolves yesterday, found a black wolf heading upstream. About the same time, someone a few miles down the road found seven members of the Slough Creek pack. Upon further inspection, our wolf was a member of the "unknown pack" and was called "Parenthesis" because she has a gray curved strip on each side right behind her shoulder. Parenthesis has an injured leg that causes her to limp. It is believed that she was left behind by her pack when she could not keep up. Karyn was laughing at "parenthesis" as a name for a wolf, as most of the wolf watchers were struggling to pronounce it clearly over the radio. We watched her move in a determined fashion up stream. We finally found her destination. It appeared that sometime in the night the Slough Creek wolves made a kill just out of our sight. This became apparent by the large bird activity. I counted 16 ravens in a single tree. 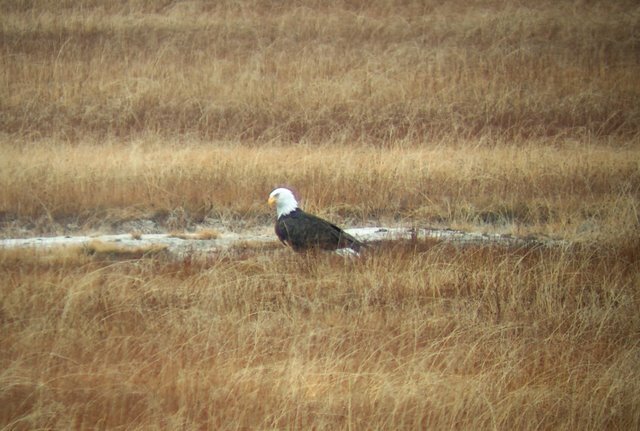 We also saw a Bald Eagle and a Golden Eagle. Parenthesis moved into the kill area. The problem was that she was in the middle of Slough Creek territory. We spotted the Slough Creek wolves as they came over the hill a mile away. They too were moving in a determined fashion toward the carcass site. As the Slough wolves approached they saw Parenthesis on the carcass and took off at a full run. Parenthesis also ran full out. She of course was running for her life. As she was more determined, she easily left the area. The other wolves didn't chase beyond the carcass site. Parenthesis was limping much more now as a result of the chase. Once a safe distance away, she laid down for an hour before moving on. A few of the Slough wolves went to the carcass to eat some more. We watched as they climbed the hill behind the carcass and eventually bedded down high on a rock outcropping. Our next agenda was to focus on river otters. Karyn and I hiked down through the meadows and willows at the confluence of the Lamar River and Soda Butte Creek hoping to find river otters. No such luck. It was a very cool hike. We found a beaver lodge, looked at various pieces of petrified wood in the stream bed, and found some meadow voles that when frightened would jump into the water. This afternoon we drove down to Hayden Valley in the hopes to see the Hayden Valley wolf pack. On the way we stopped to see today's Agate wolf kill site (they got an elk at Antelope Creek while we were watching the Slough Creek wolves). It was a unique kill site. It appeared that they got the elk at the top of a high ridge, but as they ate on it, pulled it down into the bottom of the valley out of sight. It was a very steep hill. We found a black bear near he top of Dunraven Pass and two grizzly bears in the Hayden Valley, but no wolves. It has been raining all evening making the viewing and the drive back to Slough Creek very difficult. Other species identified: Antelope, Bison, Coyote, Elk, Blacktail Deer, Marsh Hawk, Raven, Magpie, American Crow, Bald Eagle, Golden Eagle, Great Blue Heron, Trumpeter Swan, Canadian Goose, Redtailed Hawk. Not the best wildlife watching day. Karyn suggested that we wait at Slough Creek until the wolf team showed up. It was a good suggestion as there was nothing present in the Lamar Valley. There were weak radio collar signals in Slough Creek. Once it was light enough to view we started searching. The signals were getting weaker and eventually disappeared before we had a chance to find the wolves. We drove on to Antelope Creek. Not much better there. The report from Hell Roaring was equally dismal. After some indecision, we finally focused on the Hayden Valley. 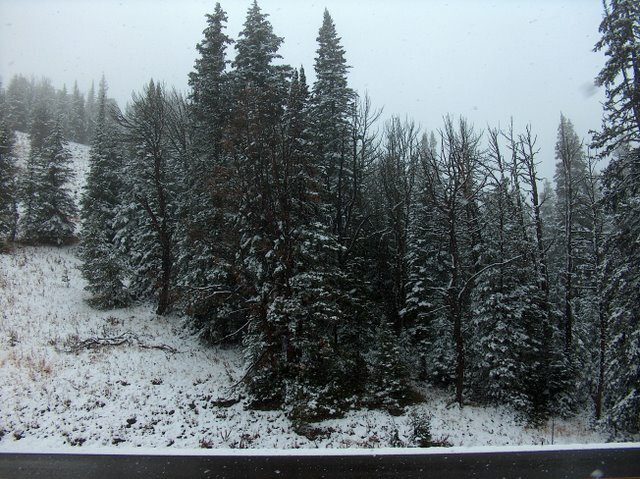 Most of the wolf team decided not to proceed as it was snowing on top of Dunraven pass. We continued alone. Once in the Hayden Valley, we didn't find any wolves. It was raining and snowing fairly heavily. 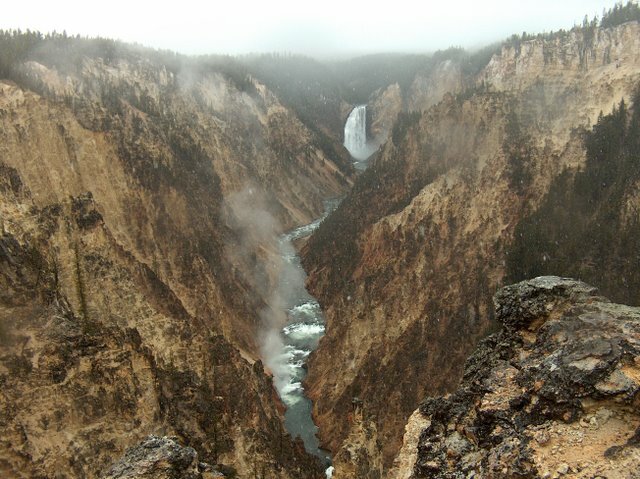 After looking from a number of vantage points we decided to do some hiking near the Grand Canyon of the Yellowstone. 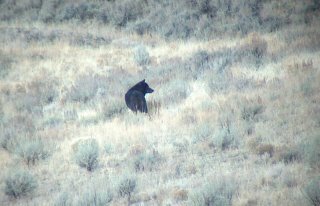 After our hike we did manage to find a Grizzly Bear in Hayden Valley. Still no wolves. We decided to drive back to the Lamar. The pass was snowy, but the roads were mostly clear. We had dinner in the Lamar, but no wolves. Spent time at Slough Creek searching as well to no avail. At least we had a good sunset on our final night in the park. Other species identified: Antelope, Bison, Elk, Marsh Hawk, Raven, Magpie, American Crow, Bald Eagle, Trumpeter Swan, Canadian Goose, Redtailed Hawk, Merganser, Dark-eyed Junco. Argh. We have to leave. We waited at Slough Creek. Nothing in the Lamar, nothing in Slough Creek. No report from Antelope. At Tower Junction we headed away from Antelope and toward Hellroaring overlook. Nothing. On to Blacktail Deer Plateau, where strong radio collar signals were received. We would need to hike high on a hill to see above a ridgeline. We were rewarded with a very cold and steady breeze, but also the sight of 536's group. 536 refers to the radio collar number of the alpha female of this group. This is referred to as a "group" as "pack" status is only granted after an alpha pair successfully raises at least 1 pup surviving on January 1st of the year after it was born. This group has 11 pups that are looking very health, so they are likely to become a pack in January. It is believed that the group had a kill in the trees as there were many birds and the wolves were lying around like a lazy thanksgiving afternoon. The pups would occasionally get up and run around, basically annoying the adults. Many parallels to humans! Running low on time for our trip home, and nearly freezing to death, we had to say goodbye to our friends and head home. Yellowstone is beautiful on so many different levels. The most impactful to me is the fact that this is the only place I know where you can witness nature to its fullest extent. You watch as the territories of life are disputed, as the perception of weakness becomes a life and death situation, as animals take risk daily to stay alive, as teamwork is sometimes the greatest strength, as beings celebrate life today as tomorrow is uncertain, and many more. I hope to soon return.